With a lakeside location in a bog-rich part of rural northern Roscommon, Derrinea Bog is one of the most picturesque LIFE project sites, and with a total surface area of 86.18 hectares, it is also one of the smallest. Derrinea Bog is located approximately 10km northwest of Ballyhaunis, just east of the Mayo / Roscommon border. It lies close to the northern side of the freshwater lake Cloonagh Lough and is bordered to the north and east by the long and winding River Anaderryboy, which emanates from Cloonagh Lough and links it to Errit Lough before eventually feeding into the much larger Lough Gara. Derrinea Bog is a small Western Raised Bog (Cross, 1990), which consists of a single peat body, geomorphologically classified as a Ridge River C type bog (Kelly et al., 1995). It is full of interesting features. For example, a small till mound is found towards the south of the site and there is a drumlin feature in the north-west. The bog has a roughly rectangular and relatively simple shape, and has been cut away most intensively along the southern edge. Despite this, Derrinea Bog is in good condition, with favourable restoration prospects. There is a good cover of Active Raised Bog (ARB) with over 17 hectares (or 31.09%) of the high bog area alive and well, consisting of central and sub-central ecotope and active flush. We are currently surveying the site, but according to the most recent survey conducted in 2012 high quality raised bog, in the form of central ecotope and active flush, covers 45.28% of the total ARB, and in the case of central ecotope has an overall Sphagnum cover of 33-50%, with pools covering 26-33% of the total area. Pool cover varies throughout the different areas of central ecotope, but is as high as 40-50% in the north-west of the site. Sphagnum lawns, hummocks and hollows are also part of the micro-topography of the central ecotope. 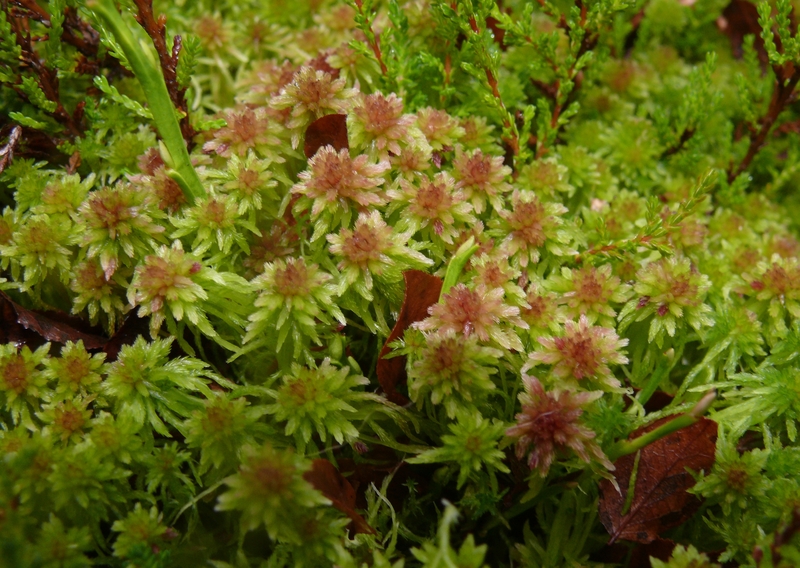 Active flush consists partly of a large pool (or soak) with a high cover of Sphagnum (mostly S. cuspidatum), and numerous island hummocks that support other Sphagnum species, and species characteristic of active flush. 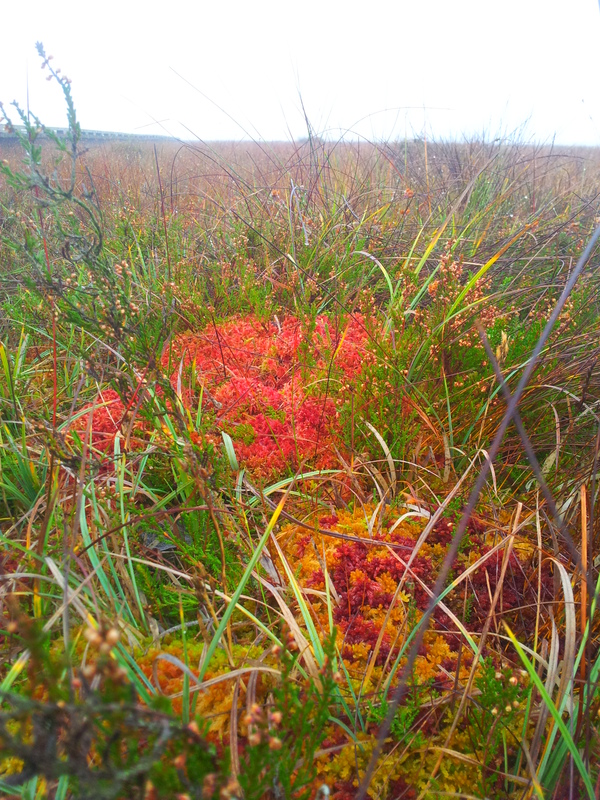 Sphagnum Cuspidatum, with leaves blown onto the bog. 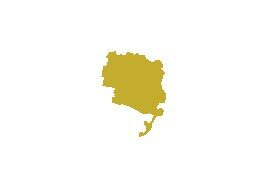 Degraded Raised Bog (DRB) covers 37.79 ha (68.91%) of the high bog area. It is drier than Active Raised Bog and supports a lower density of Sphagnum mosses – Sphagnum cover reaches 26-33% in the wettest of the community complexes recorded – and it has a less developed micro-topography with permanent pools and Sphagnum lawns generally absent. Degraded Raised Bog at the site consists of sub-marginal, marginal and facebank ecotope and inactive flush. Depressions on peat substrates of the Rhynchosporion are found in both Active and Degraded Raised Bog, but tend to be best developed and most stable in the wettest areas of Active Raised Bog. The LIFE project here aims to increase the amount of ARB by as much as 10 hectares through restoration methods on the high bog and cutover. Derrinea Bog is a site of high conservation importance as it contains examples of the Annex I habitats active raised bog, degraded raised bog and depressions on peat substrates (Rhynchosporion). The site is a good example of a western raised bog (one of three bogs of this type in our LIFE project) and although it is rather small, the quality of the habitats is generally good. A number of other raised bogs and calcareous lakes lie in close proximity to this site and together they constitute one of the most important ecological areas in the east Mayo/Roscommon region.